Easy Video Recorder for Mac is a video capturing tool for recording your screen activities into QuickTime video format in real time. Very easy to use Screen to Video Recorder software for video recording purpose including video, audio and cursor options. It supports recording video, audio, and mouse cursor synchronously or separately. You can use Easy Video Recorder to record Screen, Camera, DV, DVD, RM, VCD, or other video media into MOV file. You can use Easy Video Recorder to record Screen, Camera, DV, DVD, RM, VCD, or other video media into MOV file. 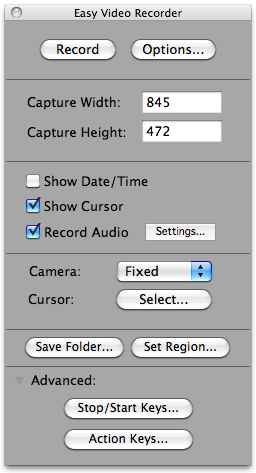 Or export captured video to many other formats including iDVD, QuickTime, DV, MPEG-4, and more. You can use it to make slide-show training documents with sound and text. You may change the options for recording, add text to video, record video with audio, choose to record mouse cursor or not, blink the area border when recording, and so on. Easy Video Recorder for Mac works well on Mac OS X 10.5 or higher. Easy Video Recorder for Mac can capture Screen, DV Camera, Web Camera, DVD Player, Media Player, QuickTime Player, Web Browser, and other applications. Qweas is providing links to Easy Video Recorder for Mac 1.5 as a courtesy, and makes no representations regarding Easy Video Recorder for Mac or any other applications or any information related thereto. Any questions, complaints or claims regarding this application Easy Video Recorder for Mac 1.5 must be directed to the appropriate software vendor. You may click the publisher link of Easy Video Recorder for Mac on the top of this page to get more details about the vendor.